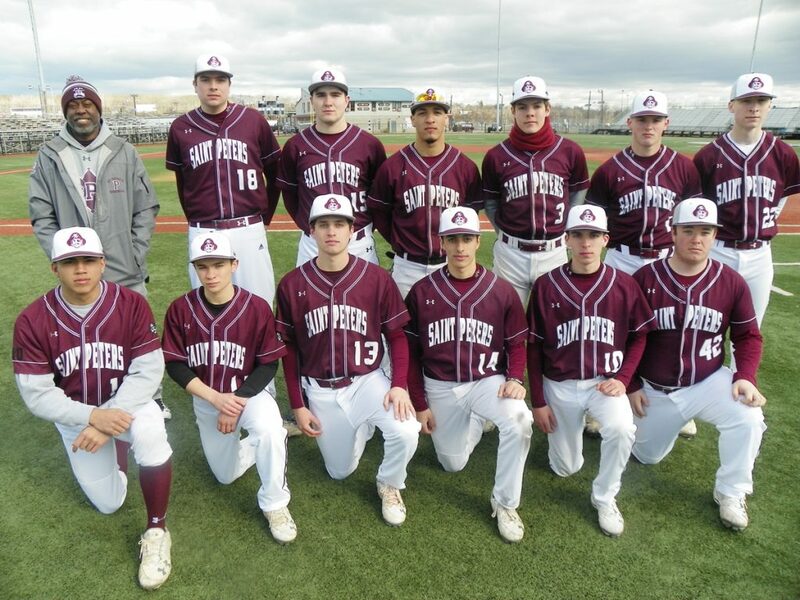 St. Peter’s Prep will count on its solid senior class to lead the way on the baseball diamond this spring. Front row, from left, are James Cruz, Rick Torres, Aidan Nolte, Andrew Chaparro, Thomas Cotter and Nick DeMarco. Back row, from left, are head coach Pat Laguerre, William Kelly, Matteo Sollecito, Jeremiah Guzman, Kyle Hess, Jack Kramer and Sean Demo. The 2018 high school baseball season was a dream campaign for Pat Laguerre and the St. Peter’s Prep Marauders, culminating in the program’s fourth Hudson County Tournament championship in the last seven years and a stellar record of 25-4. Although the Marauders graduated an astounding 13 seniors from that team, including four members of the Hudson Reporter All-Area Baseball Team as well as Pitcher of the Year and Most Valuable Player Jack Carey, now playing college baseball at Duke, Laguerre believes that he has the makings of a team that will contend once again for the county’s top honors. Laguerre said that there is a certain level of expectation that comes with being the St. Peter’s Prep baseball team. But Laguerre knows that in order for the Marauders to be crowned county champions once again, they will need someone to step in and pitch to similar standards set by Carey over the last three seasons. Junior right-hander Zack Oswald has a chance to be the Marauders’ top hurler this season. Oswald won five games last year as a sophomore. Senior righty Jack Kramer is another quality hurler who steps into a new role as being an ace starter. Senior righty Matteo Sollecito is another veteran pitcher. The Marauders have eight others who will get the chance to throw this season, giving the Marauders an ungodly total of 11 pitchers. There isn’t another team in New Jersey that can lay claim to having 11 hurlers. It’s unfathomable depth on the bump. Senior right-handers Sean Demo and Will Kelly and a host of juniors like righties Andrew DeLucia, Luis Tolentino, Aidan Nolte and Sam O’Flanagan as well as lefties Matt Moreira and Adam Botti and Laguerre can throw out a different starter every single day of the season. The catching duties will be shared by senior James Cruz (the wrestling standout), junior Joseph Vuolo and sophomore Owen Fletcher. How deep are the Marauders? Well, Laguerre has a stable of five first basemen. “We have quite a few,” Laguerre joked. Sollecito, Oswald, Botti and Tolentino all play first base, as does senior Nick DeMarco. Whoever hits among that group will obviously see the most time at first. Senior captain Andrew Chapparo, a returning starter from the county champs of a year ago, returns to his spot at second base. Senior Kyle Hess, who has already signed a national letter of intent to play baseball at Notre Dame in the fall, is the returning starter at shortstop. “He has to put it all together this year,” Laguerre said of Hess, who is also a captain. Junior Ray Ortiz, who has all the potential in the world to be a standout, is the third baseman. Ortiz already has received some college scholarship offers. Demo starts the season as the team’s starter in left field. A pair of juniors, namely Desmond Watkins and Kyle Hoog, is battling for playing time in centerfield. Senior Jeremiah Guzman is the three-year starter in right field. Junior Roddy Hernandez and junior C.J. Cerbone are trying hard to sneak into the Marauders’ lineup. Hernandez was a member of the Washington Park Little League team that went to the state Little League championships a few years ago. The Marauders open up the season with games against Kearny and Dickinson before heading to Florida for a few games over the Easter break. Needless to say, Laguerre likes the makeup of his team.